Updated Brick Ranch in Great Lakewood Location! Parking Oversized one car garage plus wide driveway. SOLD! WOW - THIS IS A GREAT HOME! 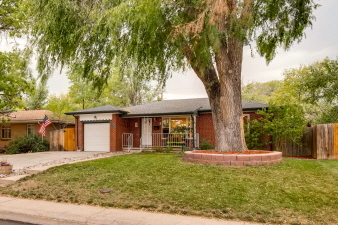 Immaculate, updated brick ranch with almost 1400 square feet on each level! Large landscaped private lot with front porch and rear patio. Loaded with updates & features: Open, bright layout*updated kitchen with 42" cabinets, tile floor/back splash, brand new black stainless appliances & more*real hardwood floors*new interior paint*new basement carpet*replacement windows**central AC*sprinkler system*oversized garage & driveway*wonderful finished basement and much more! MOVE-IN CONDITION MID-CENTURY BRICK BEAUTY!! HURRY ON THIS ONE!